Scattered Thoughts On Books. 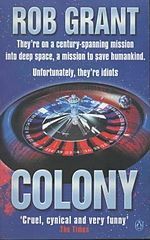 : Colony- Rob Grant. The human race is facing extinction. Global warming and overpopulation have rendered the earth virtually uninhabitable. The only hope for the survival of the species is to find a new planet. Crewed by the cream of humanity, the gigantic ship Willflower sets off for the stars on a voyage that will take many lifetimes to complete. But by the tenth generation, things have gone wrong. Badly wrong. The captain is a spotty adolescent who names planets after disgusting bodily functions, the security team have the mental agility of pond life, and the science officer is a religious nutball, who responds to danger by beating herself, naked with a whip. And the only man who can save them, the last hope for humankind is made up of the bits even the most ravenous cannibal would leave on the side of a plate. And worse yet, someone is trying to kill what's left of him. Note This review is a repost from the 5 April 2013. Rob Grant, one half of the famous Doug Naylor team that wrote Red Dwarf, went solo and in 2000 produced this nice wee number. It follows the story of the hapless Eddie O'Haire, who due to a computer error finds himself 2.2 million in debt to the local gang lords and scheduled to be killed at their earliest convenience. In a desperate attempt to get back the money he sells everything and heads to the casino to place everything on the spin of the roulette wheel. There he meets someone who he is able to trade places with and from that leads to a fast paced tale involving Identity fraud, murder and genetic breeding. Eddie winds up millions of years in the future and his body reduced to just his head in a jar and his spine inside a robot with someone out to get him, someone who knows his true identity. The crew who at the start of the mission where the creme de la creme of humanity have through a caste based system and a limited breeding pool been reduced to idiots and self centred nut jobs. The prime example is the immoral Father Lewis a man who was literally born into the cloth, however is a atheist who gets his kicks from filming the women of the ship. the captain is a teenager after his father died. These characters while they are given legs by Grant could have come straight out of a darker episode of Red Dwarf. The premise is very familiar; ie. Unlucky man wakes up on spaceship millions of miles away from home and millions of years in the future. You can compare Eddie to Lister, the captain to the Cat and Father Lewis to Rimmer. That being said the plot is kept going and the unrelenting pace of the narrative allows you to become completely engrossed in the read. I started it and was like a tramp eating chips until it was done. It's not the hardest of reads but worthwhile especially if you like Grants cynical and bitter brand of humor. Now to the balcony window to turf the book out into the cold and bitter night and replace it with some teddy bear wall stickers. I hope "Wee Beanie" thinks this is worth it, I have got rid of two things now and am almost on the brink of a meltdown. Drop me a line @dwjjones1 I would love to make your acquaintance.